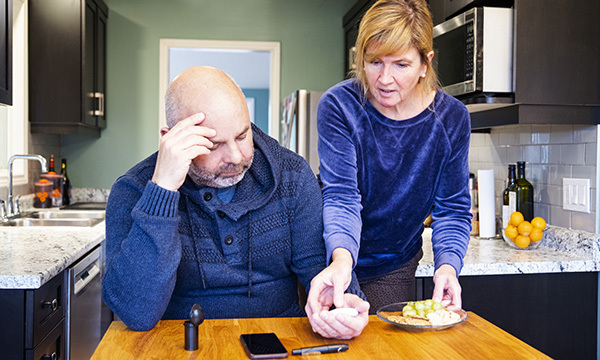 A diabetes diagnosis can be life-changing news and will often bring significant emotional strain – not only to people with diabetes, but also to those closest to them. People living with diabetes must manage their condition carefully if they are to avoid the complications associated with the condition, which include sight loss, stroke and amputation. Diabetes can feel relentless. Managing it requires people to check their blood glucose levels continually, self-administer medication regularly and attend a wide range of essential annual check-ups with healthcare professionals. The need for careful and constant self-management can seriously affect a person’s mental health. Diabetes UK research has shown that three in five people living with diabetes experience emotional problems or mental health issues because of their condition. But our new research shows that more than three quarters (77%) of carers of people with diabetes also experience problems with their emotional or mental well-being. Caring for a child or adult with diabetes can be difficult and stressful. That’s why it’s important that carers can access information that can help them help the person they’re caring for – and help them mitigate the emotional strain that comes with this role. Many carers want to have a safe space in which they can speak freely about their experience of caring for someone with diabetes, without risking upsetting the person they’re caring for. Nurses can direct carers to Diabetes UK’s nationwide network of local support groups, where carers can meet people in similar situations to them and share experiences. However, like everyone else, many carers have busy lives and will find it hard to attend a local support group. If this is the case, you can direct them to the Diabetes UK support forum, where carers can share their experiences with others from the comfort of home. The website also has a range of learning options for healthcare professionals. Carers of people with diabetes often will not feel comfortable bringing up their own mental health, so give them the opportunity to speak about this in a non-judgemental space. Make time during appointments to ask the person with diabetes, and their carer, about their mental health. This only takes a moment, but can make a big difference. A poor choice of language can be detrimental to a person’s psychological well-being, so consider the language you use when talking to people with diabetes, and their carers. NHS England’s Language Matters guide is a good place to start, and can help healthcare professionals be more aware of how they’re speaking about conditions such as diabetes. Educating others and creating a better public understanding of diabetes is another way to improve the mental well-being of people living with diabetes and their carers. It can be so frustrating to have to constantly dispel the same myths about the condition. Make sure you have a grasp of the essential aspects of diabetes if you’re working with people with the condition, and help educate your colleagues if you think it’s necessary. RCNi Learning has a range of modules on type 1 and 2 diabetes.